Eddie is an honest, compassionate man who finds himself, at the age of thirty-eight, with a wife, a child, and three dollars. How did he get that way? He is a university graduate. He married an attractive intelligent woman, his lover from university days. He is a good husband, father and son. At any other time the world would smile on him. But this is the nineties, and the world values other things. 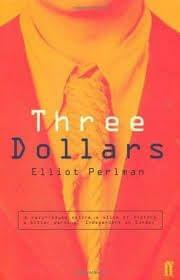 Angry, yet full of unexpected humour, Three Dollars chronicles a modern breach in the social contract, and the legacy of Thatcherism and Reaganomics and its effect on people and relationships. It is about a mans attempt to retain his humanity, his family and his sense of humour in grim and pitiless times; about what happens to people in our brave new world of downsizing, outsourcing and privatising.